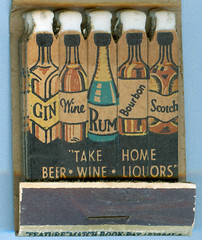 Vintage matchbook photo by jericl cat, via Flickr/Creative Commons. With the recent passage of Initiative 1183, Washington’s grocery stores are rushing to apply for new liquor licenses which will allow them to sell spirits. Beacon Hill’s Hilltop Red Apple Market and the nearby Rainier Valley QFC are no exception; both stores have recently filed “added/change of class/in lieu” applications to be classified as spirits retailers, along with their existing beer/wine licenses. If you want to comment to the state Liquor Control Board about either of these applications, email customerservice@liq.wa.gov. The Red Apple license number is 350969, and the QFC license number is 353298.